Alright Griz fans, we’re 2 days removed from a big road win and I’m just getting my post game thoughts up. Typing this up on the notepad from my phone, so I’m going to keep it shorter this time around. I’m in Oregon for a friend’s wedding, hence the late post and short(er) version. – The offensive line just keeps getting better. Now I know this is probably the worst front 7 they have (and probably will) face, but the amount of time Sneed had to throw and the wide open lanes these guys pulled Open was damned impressive. I never felt like the offense couldn’t get a score back mostly bc of how solid the OL was performing. – The defense made sure to make Poly pay for their mistakes. In my scouting report I said that Poly is going to offer up some turnovers, they sure did. The defense and special teams converted 2 turnovers, one scored a TD, the other lead to a quick TD score. Additionally the defense stopped Poly on 4th down three times, and on ensuing possessions the Grizzly offense scored TDs. – Furthermore on the defense, I had tweeted this, they were on the field for almost 39:00 of game time and faced 95 plays. Yeah they gave up some yards but overall this was a pretty good showing keeping Poly from ever being within a “close” range. There were hardly any long plays save a few deep passes that were ripped off. All things considered this was a damn solid effort. – Could this be the game where Eastwood finally starts to show that next level of confidence in his play? The first few weeks (to me) he was seeming to just not find holes and make big plays, save one longer TD run. This game though I saw the Eastwood that would flash these types of skills in camp. Last week post game I mused that the Sneed fake-pitch won’t work forever and the run game has to develop. Poly this week over-emphasized containing Sneed and let Eastwood run wild. This is a very good thing for the running game moving forward, who do you key in on? – It was so refreshing to see a defensive scheme adapted to attack the Poly offense to keep it somewhat under wraps. There was a great use of rotation in the depth, and shifting on the D line. Multiple prior DC’s never showed a good adaption to address Poly. Baer and staff did. – Posted it last week that Akem needs to be a greater part of the game and he showed why. His TD was a 2nd move on a busted route (I think) and just found space to help Sneed out. – Sneed has added a little more to his game each week and this time around we got to see him actually have time to go through progressions and not panic and take off running too soon. While it’s early he’s currently leaning the Big Sky in total offense, ahead of even Gubrud. Suffice to say, if the season ended right now he’d be in discussion for Big Sky mvp. – Eleven Sports is trash and an embarrassment as a media representative of this conference. I was watching in a spot where I couldn’t hear the sound much but I read plenty of complaints about that too. – Two passes, no catches, in the endzone to Curran. The TV camera work left a lot to be desired, I couldn’t tell if the first one he had it and the DB hit his arm or if it was a drop. The 2nd lead to the pick but I had no clue if that was on the throw, good coverage, or another drop. There was I believe mention of a drop by Sulser and maybe Toure as well? The camera work missed those entirely. With how skilled this WR corps is this shouldn’t be happening this much. – More improvement on special teams as well is a good thing to see. Semenza stays perfect, coverage was good (did give up a few returns but not terrible), and of course a recovered fumble by OD. – 2nd week in a row that Justin Calhoun gets caught on deep passes not finding the ball in the air. In both the PSU and CP game the catches were tremendous ones though. These are small things he’ll get back as he gets comfy at corner again, but I assume teams are going to keep attacking him with those types of deep shots. All in all a good win with still plenty of things needed to clean up. The defensive guys are probably still worn out from that effort, hopefully this weeks PSU game doesn’t catch them flat footed. I think this is a nice sign that we’re seeing ongoing improvement rather than flat or regressing play, which we could have found in other years prior at times. 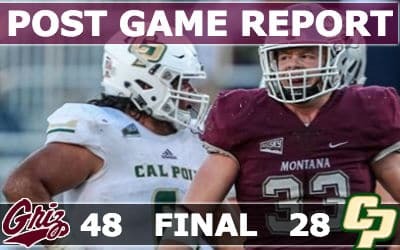 While it’s early and this was a win they should have had regardless I really liked how the Griz came out and handled business.